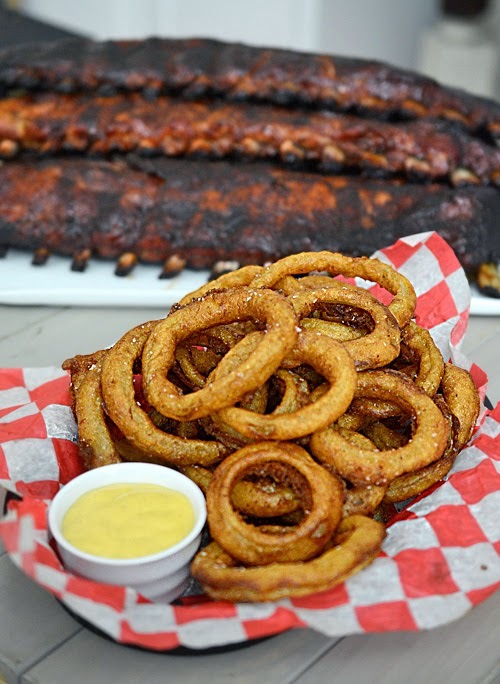 We wanted some pub style food for the weekend games so I decided to make some ribs and onion rings this weekend. 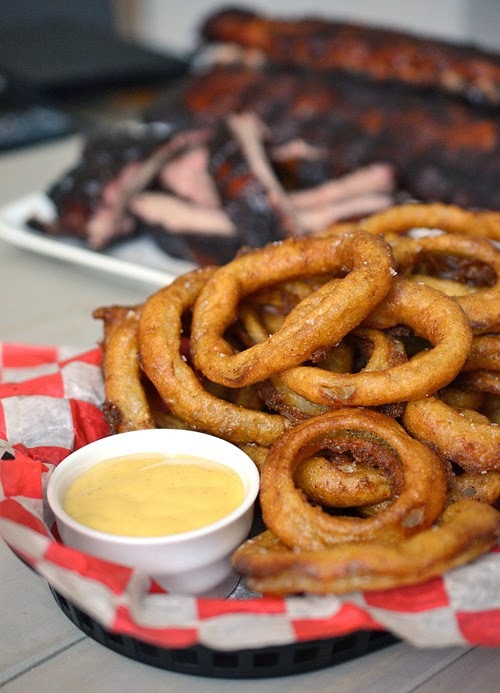 Is there anything more "pubby" than beer battered onion rings? 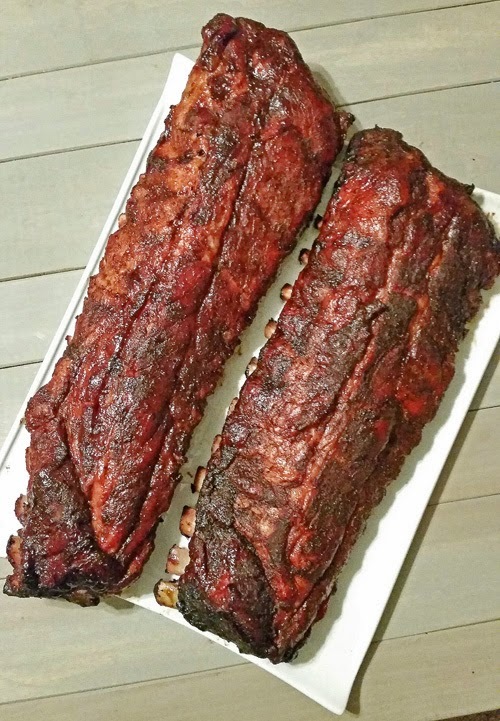 I made the ribs using the Apple Cider Ribs recipe from Chris Lilly's 2014 book, Fire & Smoke. It's a great book and it would be a good present for the griller on your shopping list. 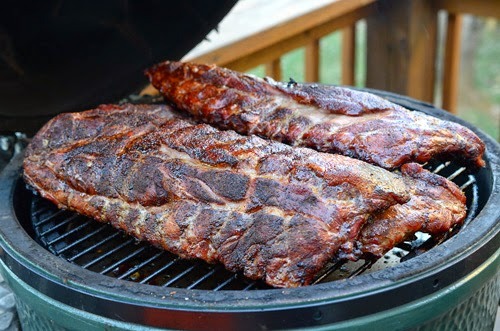 As much as I tout the advantages of the kamado grill (Big Green Egg, Kamado Joe, Grill Dome, Primo, Vision, Etc), there is one thing that bugs me when cooking ribs on them. With the indirect set up using a plate setter/heat diffuser, the end of the ribs stick out over the gaps which are hot spots noted by the red arrow in the picture below. This means those parts of the rib will cook faster and unevenly. Sorry about the mobile phone picture. 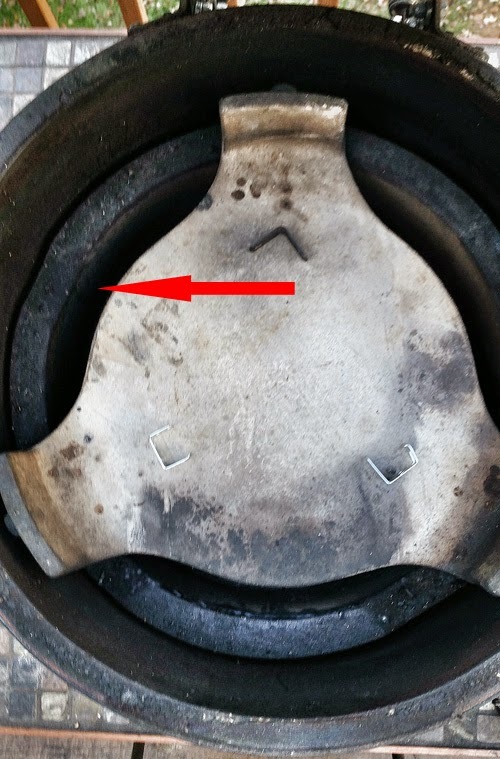 Red arrow points out the gaps where you have hot spots while grilling indirect using a plate setter. I thought I would try to do something about that this time. 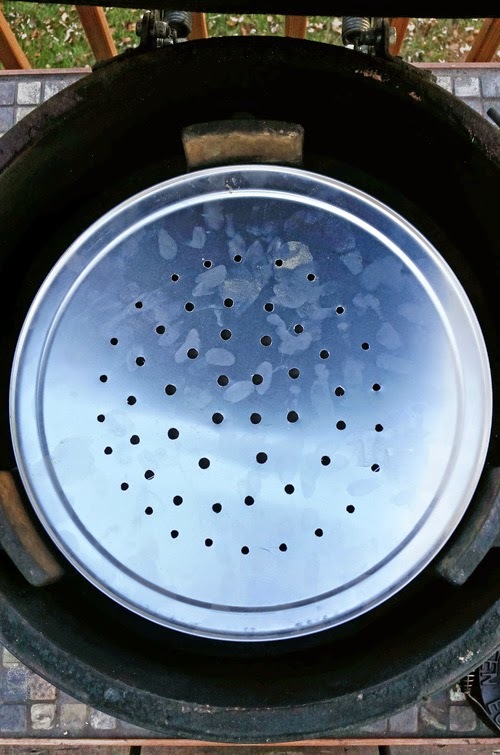 I used a 16" pizza pan ($5.49 at Gordon Food Services) and drilled holes in it. I placed this 1" above the plate setter. The pan edges help deflect the heat from those hot spots so the heat can't just come straight up and hit the food. The holes give the hot air somewhere to go besides just around the edges of the pan, otherwise I'm just pushing the hotspots out a little further. This worked pretty well at tuning down the hot spots just like using tuning plates on a stick burning, offset smoker. This isn't something that you have to have, I just think it makes a great grill work just a little bit better. These loin back ribs were HUGE, weren't they? I prefer true baby backs (2 1/4 lbs and down) but these were all that we could find at the time. It worked well enough that I'm going to play around with that design some and make a better version with legs built in and the holes drilled symmetrically once I find the best pattern. More mobile phone pictures - sorry 'bout that. 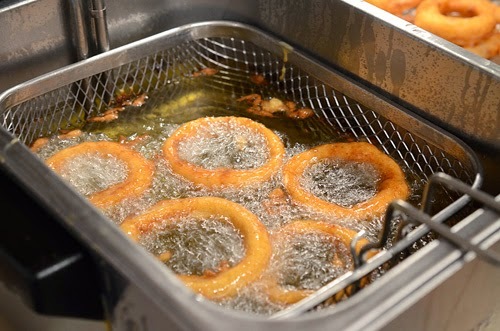 The onion rings were an idea I had back when we did the tailgate party but I nixed them from the list because our deep fryer had kicked the bucket. 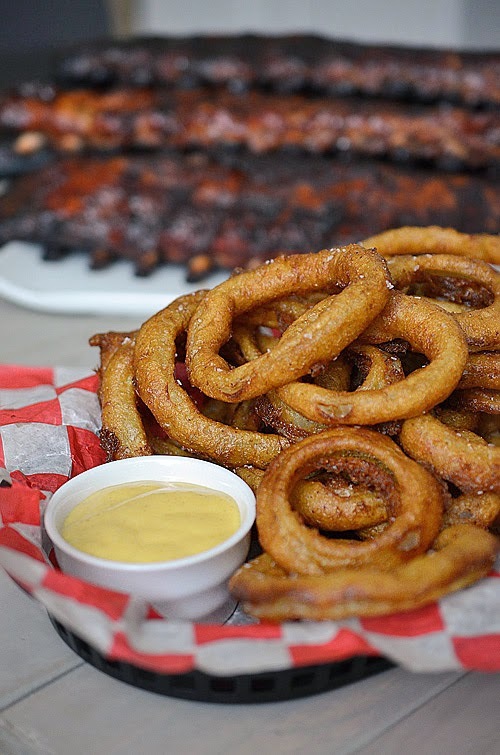 I thought that adding one of the El Diablo Mustard varieties to my onion ring batter would spice things up a bit. 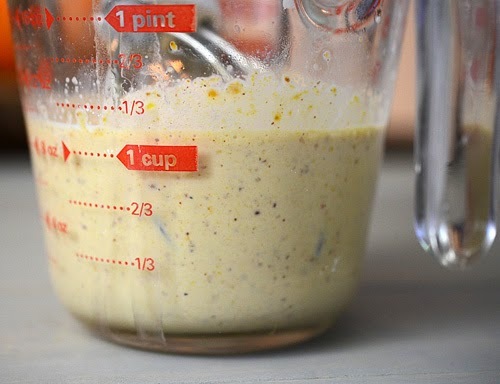 This recipe is mild as written, to increase the heat to medium just increase the mustard to 1/2 cup. For hot, add in some of your favorite hot sauce. Mix together the dry batter ingredients in a medium sized bowl. Whisk the wet batter ingredients and then whisk that into the dry ingredients until combined in a smooth batter. Heat your deep fryer or oil in a Dutch oven to 375°F. When deep frying, always follow manufacturer's instructions, use personal protective equipment, and ideally have a Class K fire extinguisher available. Dip 5-6 onion slices into the batter, shake off the excess batter and lower into the hot oil. Cook until golden brown on the first side, about 1 minute, and then use a long utensil to flip them. Cook the second side until golden brown, about half the time that the first side took. Remove to a resting rack over paper towels. Lightly season with fine salt. Keep warm in a 200°F oven*. Repeat with remaining onion slices until all are cooked. *The ignition point of paper is about 451°F so the paper towels should not ignite in a 200°F oven but I would only do this since I am near the oven the whole time and it will only be in the oven for about 10-15 minutes total. 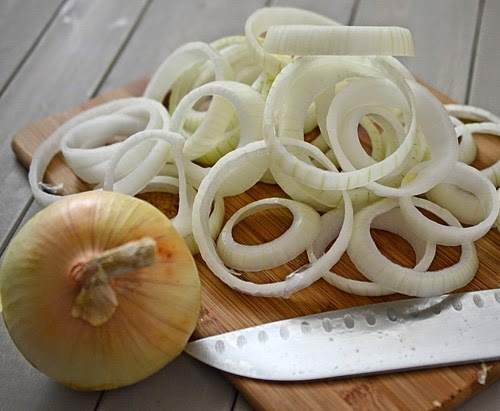 You can use types of onion other than Vidalia, I just like their sweet taste and meaty rings. This is just the wet ingredients - look at all of that seasoning from the El Diablo mustard. If substituting a different type, look for one loaded with visible seasonings, not plain yellow or dijon. 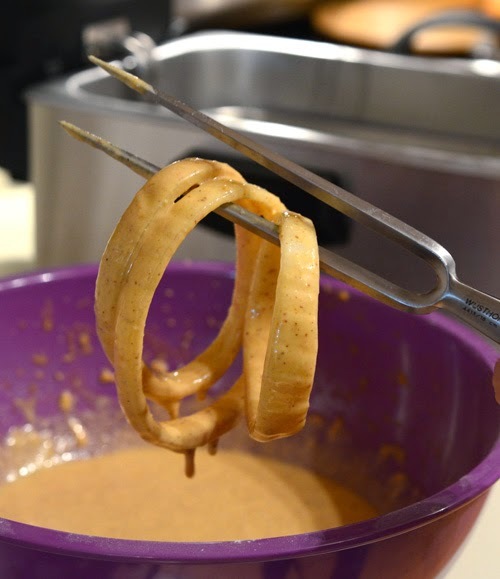 I stumbled on to this but a straight carving fork is perfect for handling the onion rings in and out of the batter as well as in the hot oil. Notice the texture of the batter - that's where you want it. If it is too thick, just add a beer 1-2 tablespoons at a time until you get the consistency like this. Excuse the blurry picture but I was holding this as I took the shot and was paying more attention to keeping my hand out of the 375°F oil. 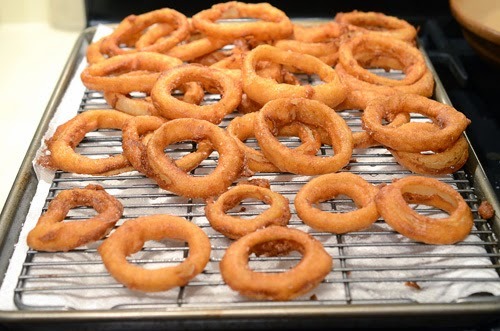 To keep the onion ring from sticking to the basket, hold each ring like this for about 3 seconds to let it start cooking before letting go all of the way. The color is your guide of when to flip and remove the onion rings more than time. Also, give your oil a chance to recover its cooking temperature between batches. You definitely don't want the oil dropping below 350°F. 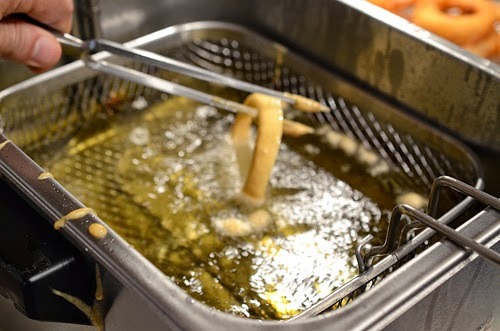 It is best to season fried foods as soon as they come out of the oil so keep doing it in small batches. Don't wait until the end to season them all at once. Honestly, I ate more onion rings than I did ribs.